Entropay is one of the systems for money transfers and payments available and popular in Canada. They differ from the web wallets like PayPal or WebMoney significantly: Entropay is issuing a virtual VISA. Using this card, it is possible to make online shopping, replenish your online casino balance and do much more things pretty much like real VISA. Virtual VISA (or a MasterCard as the other payment systems provide) is a chance to significantly increase your Internet payments security, as you will not have to have a physical card to make payments and to restrict the availability of its balance for Internet payments to low amounts playing with them each time you need to make a purchase (which can be pretty urgent). 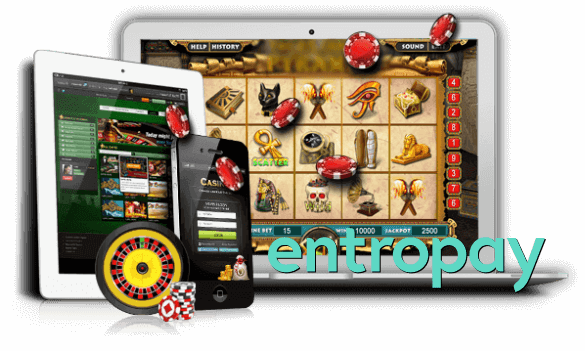 Make sure you register in Entropay for a good reason: a necessity to pay into your online casino account or to make a more secure shopping without giving anybody a number of your physical card. After you register in the system (passing through a standard verification process that may require checking your identity), you will be given with a full number of a card, its expiration date, a cardholder’s name embossed on a card, and a CVV number – all obligatory parameters to do Internet shopping. The mandatory step – the refilling of a card, as this card is a debit only, it has no credit limit on it or the possibility to set it up after some time. It is simply to do from any your existing bankcard with the direct money transfer or from your Internet banking if your bank provides such a service. 1. You will not be able to spend more on that card that you have a balance on it – it’ll limit you if you are a venturesome gambler. 2. Less risk for your money on the Internet. 1. As it works a little bit not the same as physical VISA, there may be payments rejection in online casinos or other places if they are round amounts like USD 100, USD 300 and so on. To eliminate this con, try to make odd payments like USD 57.36. 2. Impossible to use offline, where a physical card’s presence is required. A nice to use by Canadian people, easy to refill and operates pretty much the same as the real card.